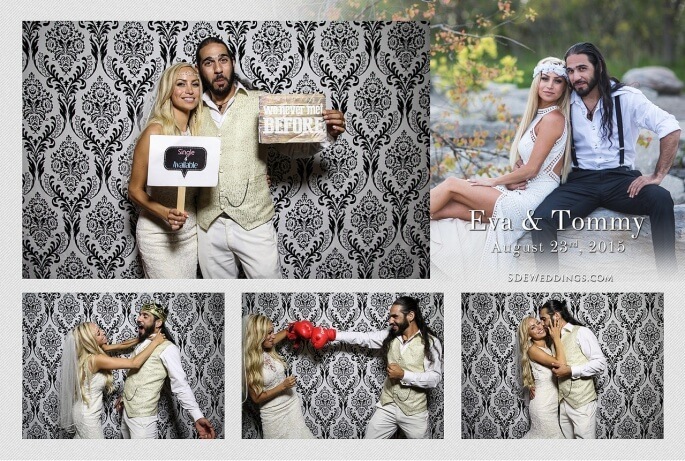 A bright and beautiful summer morning would begin a lovely day for us here at SDE Weddings, Toronto’s premier Greek wedding videography, cinematography and photobooth-rental group, when our best and brightest visual artists were on scene for Eva & Tommy’s wedding, which took place just last year on August 23rd, 2015 in a fantastical feature event with a solemn ceremony held at Toronto’s St. John’s Greek Orthodox Church, a playful post-ceremony photoshoot at Toronto’s Rosetta McClain Gardens and a wonderful evening to end a very special day – with a celebration to close the show, held at the superlatively stunning Mississauga Grand Banquet & Event Centre. Eva & Tommy, an energetic young couple of shared Greek heritage, held an absolutely unforgettable wedding, one that would put the aptly-named cult classic film “My Big Fat Greek Wedding” to shame! Indeed, with our videographers and cinematographers on hand throughout the day, Eva & Tommy’s star-struck romance, culminating in a gorgeous wedding ceremony and ending with an energetic celebration of two lives made complete, would play out on film as though life were imitating art itself, but let’s leave that to the highlight reel to convince you. So join us as we go through Eva & Tommy’s wonderful wedding day and detail many of our videographers’ and cinematographers’ favorite scenes. The summer season, for our videographers and cinematographers, has always proved plentiful when it comes to perfect weather, perfect wedding days and perfect shots to complement it all. 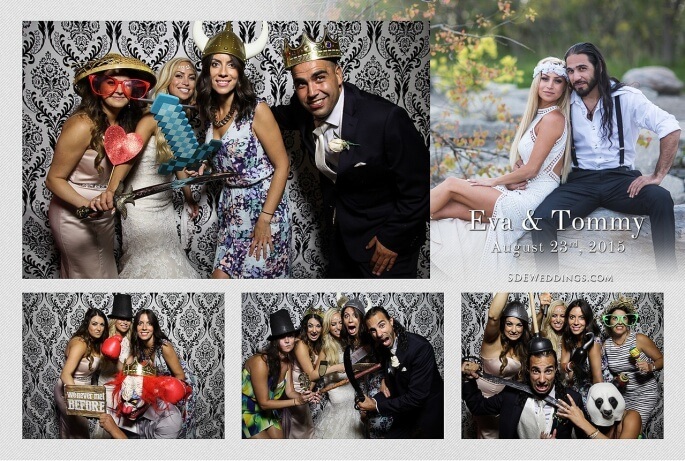 So for Eva & Tommy’s wedding, our videographers and cinematographers were utmost excited in capitalizing on the best possible conditions to capture the best possible shots. We began with the preparation sessions for both bride and groom, in two separate entourages, that would later meet as one for the long-awaited wedding day moment. A few choice shots stand out for our videographers and cinematographers – for the morning, you can see in the highlight reel that we had interspersed footage from both bride and groom fitting on their wedding day attire in preparation for the celebration that await them. Eva & Tommy chose a very splendid stylistic theme for their wedding, with Eva fitting on a beautiful one-piece wedding gown and Tommy complimenting his soon-to-be bride with a unique golden-laced suit that, together with his gorgeously adorned bride, made the couple almost shimmer throughout the scenes captured by our lenses. Keeping the mood as bright as ever, Eva & Tommy set out for the ceremony ahead, convening at St. John’s Greek Orthodox Church. A first for our videographers and cinematographers, the church interior was a splendid sight to behold. 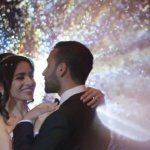 As you can preview in the highlight reel, we feature a beautiful shot of the church interior illuminated by a massive chandelier, unique in Greek orthodox fashion and one of the most stunning centrepieces we’ve ever witnessed at a wedding ceremony. For the moment-of-glory for the couple, their twin souls now tied in marriage, we include the deeply emotional shot of Eva & Tommy’s first kiss as husband and wife at the centre of the highlight reel edit. An asymmetric and non-chronological stylistic choice for our editors, this editing approach provides a unique cinematic element to the highlight reel. Of course, words wouldn’t suffice to simply explain it, so we’ve attached the highlight for you to preview. Our videographers and cinematographers then proceeded to Toronto’s Rosetta McClain Gardens. A first visit for our videographers and cinematographers, we trailed Eva & Tommy’s entourage as they toured the gardens, sharing in playful shots for the cameras – and a very special one which we conclude the edit with. And as Eva & Tommy and their family and friends conclude the ceremony half of the wedding day, so too begins the long night of celebration ahead. 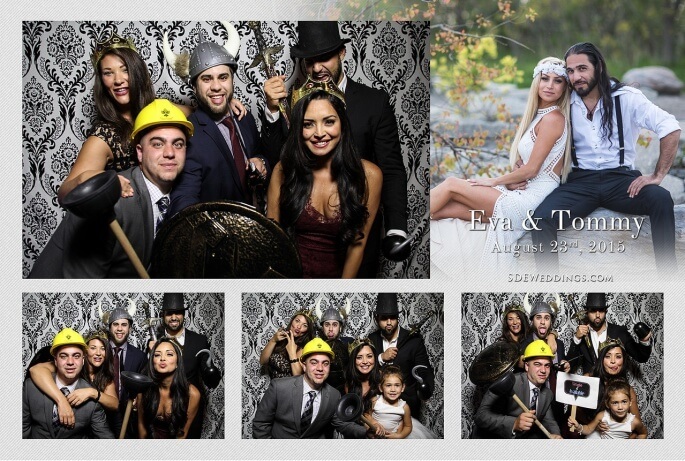 The newlyweds had chosen the Mississauga Grand Banquet & Event Centre as their go-to destination for their celebration, and what a gorgeous venue it was! Keeping in line with the theme of radiating brilliance, of brightness and shimmering light that kept the couple bright and radiant throughout the day, the banquet hall had been lovingly illuminated by a plethora of candles, big and small, that scattered themselves about every part of the hall’s interior – symbolically signifying a bright future for Eva & Tommy. In any case, such a sight was a joy to behold for our videographers and cinematographers, who made sure to feature it in the attached highlight reel. And as the night grew long, and the candles slowly burnt through the evening, Eva & Tommy’s night could only get more and more extravagant. In an interesting shot, we feature the newlyweds Eva & Tommy partake in the Greek traditional wedding money dance – with the bride and groom veiled in a thread made of fifty bills. A wonderfully playful sight to see! And in the end, what we could certainly say about Eva & Tommy’s wedding was that it had been a truly bright and brilliant day, full of liveliness and energy, and that such a contagious positivity made for excellent footage for our videographers and cinematographers, and made a very special day for Eva & Tommy truly ever more special – with plenty of wonderful memories made eternal through our videography and cinematography. 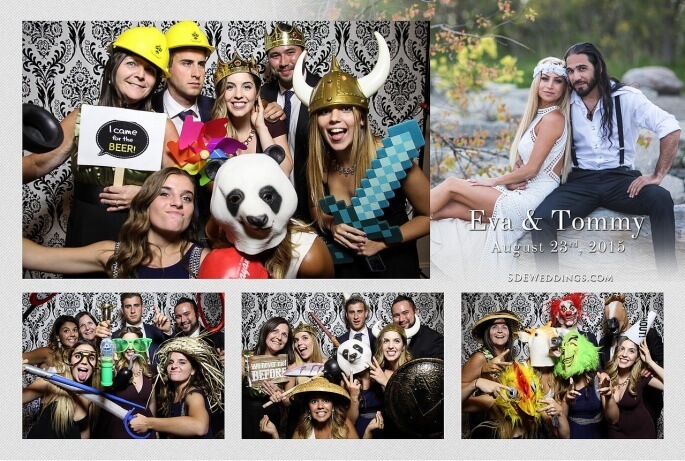 In the end, we here at SDE Weddings, Toronto’s premier wedding videography, cinematography and photobooth group, wish Eva & Tommy the very best in their new life together, and hope that every day for them will be just as bright and lively as the first. 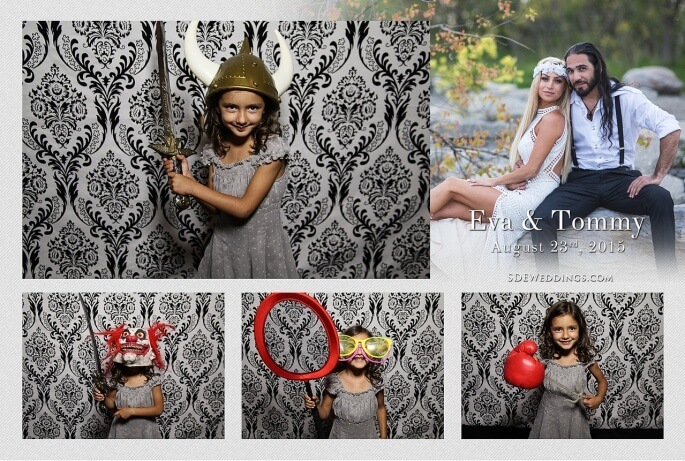 Here are our photo booth rental photos from the wedding. Wedding ceremony: St. John’s Greek Orthodox Church | 1340 Warden Ave. 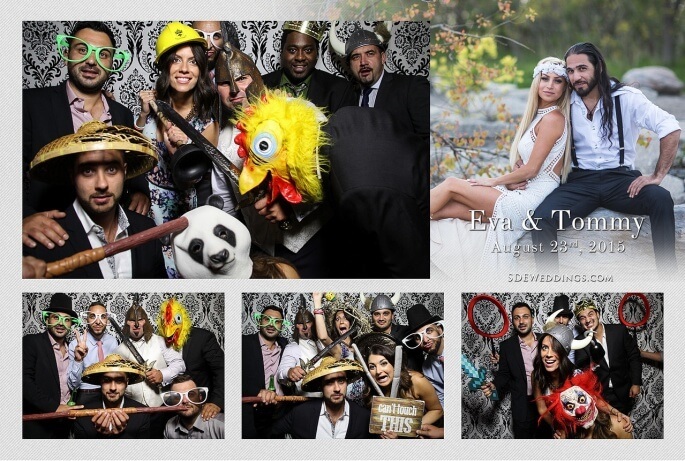 Wedding reception: Mississauga Grand Banquet & Event Centre | 35 Brunel Rd. Wedding photo-shoot location: Rosetta McClain Gardens | 5 Glen Everest Rd.